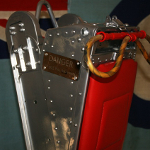 Vintage Aircraft Furniture has drawn inspiration from the design and use of Martin Baker ejection seats. Martin Baker is the world's longest-established manufacturer of ejection seats and has helped save over 7000 lives. The engineering and design of these seats has made them a classic icon and they are perfect as office chairs or den seating. We offer a number of designer office and aeroplane chairs, with the polished ejection seats standing out as the ultimate in designer office or den furniture. Click on the links below to view the individual seats - they make the perfect present for someone who has everything!